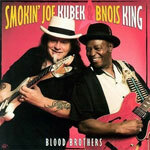 With more than a dozen albums over almost 20 years, guitarists Joe Kubek and Bnois King are one of the longest such partnerships still going in the blues. And it's been an uncommonly productive partnership, with Kubek's brawny lead guitar contrasting nicely with King's refined tenor voice to create as instantly recognizable a sound as any blues combo today possesses. And after all those years together, all those times in the studio, Kubek and King and the rhythm section of Paul Jenkins (bass) and Dave Konstantin (drums) have a musical empathy that makes them sound, as one critic wrote on AllMusic.com, like a single musician. Thirteen of the 14 songs here are originals written by the two; a lengthy, relaxed reading of Lightnin' Hopkins' "Stop Drinking" is the only cover. The songs are all a rock-blues hybrid, with lots of cross-over appeal for anyone who appreciates a solid blues shuffle and a guitarist who knows how to put on a show.